Two people were killed Monday evening in Vista after a chain reaction crash on Highway 76. 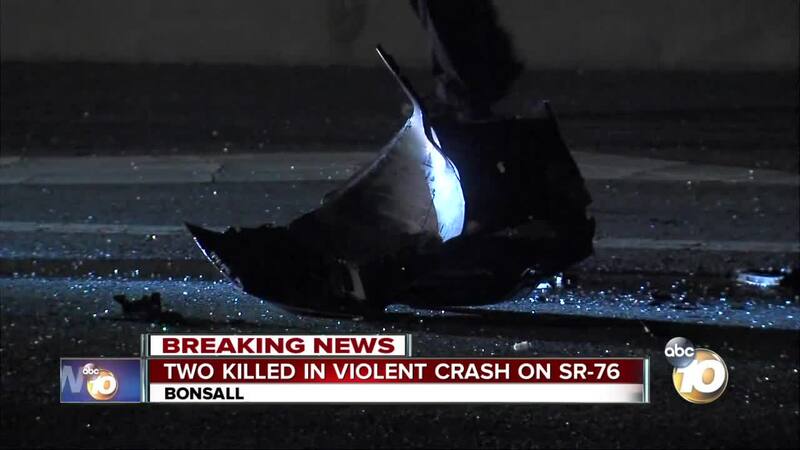 VISTA, Calif. (KGTV) - Two women were killed Monday evening in a chain-reaction crash on state Route 76 just outside of Bonsall. According to the California Highway Patrol, the crash happened just after 6:30 p.m. on eastbound SR-76 near East Vista Way and involved four vehicles. The CHP says a Chevrolet Silverado was approaching the intersection of East Vista Way at about 45 mph when the 40-year-old male driver tried to avoid a Hyundai Sonata that was stopped for traffic. The Silverado attempted to brake and swerve to avoid the Sonata but could not do so in time. The Silverado struck the back of the Sonata, sending it into the rear of a Mazda CX-5. The Mazda was then pushed into the back of a Ford Fusion. According to the CHP, two women inside the Hyundai died at the scene. A man inside the Hyundai suffered major injuries and was rushed to an area hospital. Occupants in the other vehicles involved were not hurt, the CHP said. Alcohol and drugs were not believed to be a factor in the incident, but the wreck remains under investigation.